Official synopsis: "'If an Outsider wields the blade, the House of Koronos burns...' A boy on the run. A deadly prophecy. A race against time. Hylas the Outsider is captured by slavers. Set to work in the terrible underground mines of Thalakrea, he learns to his horror that he's now closer than ever to his murderous enemies, the Crows. He has to escape before they find out he's here. Pirra, the daughter of the High Priestess, is also on the run. When Fate reunites her with Hylas, their survival depends on ancient magic and an orphaned lion cub - unless the Gods have other plans..."
Ah. What a wonderful day. The arrival of a new Michelle Paver book is always a special event for me. That special day that comes but once a year and it brings with it a sense of wonder, amazement, excitement and a sliver of fear at what might happen next to the characters you're coming to love. I thoroughly enjoyed Gods and Warriors which was released last year, kick-starting this series of the same name, and I remember saying in my review (which can be found here) that it felt very much a world building book that was setting things out nicely for the series to build upon these foundations and grow, and flourish. And after reading The Burning Shadow, I stand by that comment. We find Hylas trapped - he's a slave, set to work in the copper mines on the side of a mountain in Thalakrea, and he isn't a lone. Hundreds, if not more, are working tirelessly for little or no reward just to appease Kreon, the man who owns them. And to make thing's worse, he's a Crow. Pirra is also making moves to do what she wants. Her mother, Yassassara, the High Preistess is planning to send her away for good and Pirra is having none of it. She plots a daring escape and when she meets a wise woman called Hekabi she see's a way out. But Hekabi is not what she seems and Pirra is drawn away from Keftiu again into danger, back into the eyesight of the crows, and Hylas. I don't even know where to begin with my love of this book. I've read Gods and Warriors several times, or The Outsiders as it now known after the paperback re-print..., and I really have come to love Hylas and Pirra. The characters are building, their progression plain to see, none more so than Telamon who... I can't even begin to explain the changes that boy is going through, you need to read it! And Havoc! The lion cub. She's rivalling Wolf in Michelle's Chronicles of Ancient Darkness for my favourite fictional animal ever. She's just so beautifully imagined and the way Michelle seems to have gotten in to her head, the way she does for every animal she writes. It's amazing and it adds to the whole magical feel to the story, this kind of mystical edge that makes you tingle. Just so good! The book, as you'd expect being a Michelle Paver affair, is so well thought out, planned, and so beautifully written that you can't help but become addicted and fly through its 271 pages at breakneck speed. I am loving this world, I'm loving this series and I seriously cannot wait to see what Michelle has in store for us next. 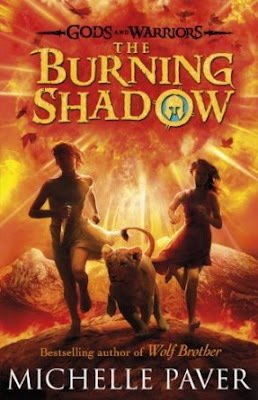 The Burning Shadow does an amazing job of taking the foundations laid in Book 1 and building upon them with such grace and thought. I remember seeing a video on her website and on the Puffin Live event she did earlier this year, or maybe it was end of last, I can't remember, where she said Book 3 features a falcon... and we go to Egypt! I cannot wait! This is a really good review, and you've made me want to read it. The artwork on the cover of the book is amazing as well.